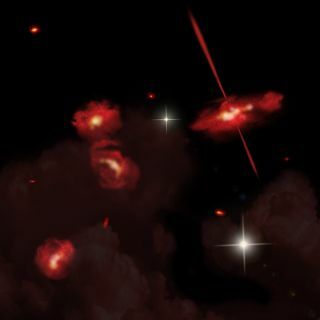 This artist's concept shows four extremely red galaxies that lie almost 13 billion light-years from Earth. Discovered using NASA's Spitzer Space Telescope, these galaxies appear to be physically associated and may be interacting. One galaxy shows signs of an active galactic nucleus, shown here as twin jets streaming out from a central black hole. Scientists have spied a new type of ultra-red galaxy lurking at the far reaches of the universe, a new study reports. Using NASA's Spitzer space telescope, the astronomers spotted four remarkably red galaxies nearly 13 billion light-years from Earth — meaning it's taken their light about 13 billion years to reach us. So researchers are seeing the galaxies as they were in the early days of the universe, which itself is about 13.7 billion years old. NASA's Hubble space telescope has imaged even more ancient galaxies, but the four ruddy objects seen by Spitzer are a breed apart, researchers said. "Hubble has shown us some of the first protogalaxies that formed, but nothing that looks like this," study co-author Giovanni Fazio, of the Harvard-Smithsonian Center for Astrophysics, said in a statement. "In a sense, these galaxies might be a 'missing link' in galactic evolution." The four newfound galaxies shine much more brightly in infrared light than in visible wavelengths, which is how the infrared-sensitive Spitzer was able to detect them. The research team still isn't sure why they're so strikingly red. There are three main reasons why a galaxy may appear red, researchers said. First, it may be extremely dusty. Second, it could contain many old, red stars. Or third, the galaxy may be extremely distant, in which case the expansion of the universe has stretched its light to very long (and very red) wavelengths. All three of these factors may be in play in the newfound galaxies' case, researchers said. But they're not sure, since much about them remains mysterious. "We've had to go to extremes to get the models to match our observations," said study lead author Jiasheng Huang, also of the CfA. The four galaxies are grouped together and appear to be physically associated, rather than constituting a chance alignment of like objects, researchers said. The team hopes to study the galaxies further, perhaps employing powerful ground-based instruments such as the Atacama Large Millimeter Array in Chile. And they'd like to find more examples of this new type of galactic "species." "There's evidence for others in other regions of the sky," Fazio said. "We'll analyze more Spitzer and Hubble observations to track them down." The astronomers reported their results online in the Astrophysical Journal.